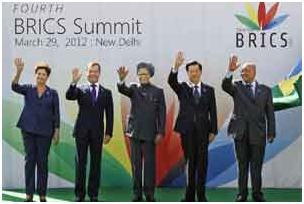 On Thursday morning, President Hu Jintao of China, President Dmitry Medvedev of Russia , President Dilma Rousseff of Brazil, President Jacob Zuma of South Africa and Prime Minister Manmohan Singh of India shook hands at the start of the one day meeting in New Delhi. Top of the agenda was the creation of the grouping's first institution, a so-called "BRICS Bank" that would fund development projects and infrastructure in developing nations. Less noticed and commented upon is the aspirations of the BRIC nations to become less dependent on the global reserve currency, the dollar and to position their own currencies as internationally traded currencies. The leaders of BRIC nations and other emerging market nations have adopted the idea of conducting trade between the five nations in their own currencies. Two agreements, signed among the development banks of Brazil, Russia, India, China and South Africa, say that local currency loans will be made available for trade between these countries. The five fast growing nations participating in local currency trade will allow participants to diversify their foreign exchange reserves, hedging against the growing risk of a euro or dollar crisis. The BRICS want to have easy convertibility of currency to make it easier to use the real, ruble, rupee, renminbi and rand amongst themselves without having to always use the US dollar. Higher intra-Brics trade, conducted in their own currencies would shield their economies from economic dislocations in the west. Left unsaid so far is the possibility that one of the BRICs or the BRICs in unison might peg the value of their respective currencies to the ultimate store of value and money - gold. Gold’s London AM fix this morning was USD 1,664.00, EUR 1,246.16, and GBP 1,037.54 per ounce. 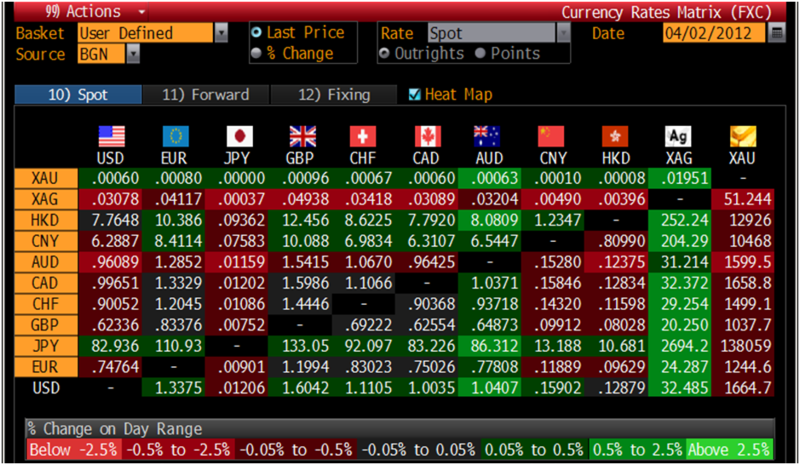 Friday's AM fix was USD 1,655.75, EUR 1,245.86 and GBP 1,041.22 per ounce. Gold’s still strong long term supply demand fundamentals and the long term trend of rising gold prices remain a gold buyer’s friend. India’s gold imports will drop near 59% to about 125 tonnes in the 3 months through March as the tax increases boost retail prices by more than 6%, Prithviraj Kothari, president of the Bombay Bullion Association, said. That compares with 306 tonnes imported a year earlier, according to data from the World Gold Council. He acknowledged that a BRICs bank was being created and said that the World Bank supported such a bank. He said that not having Russia and China as part of "the World Bank system" would be a “mistake of historic proportions”. Sales of gold coins by the U.S. Mint rose to an estimated 62,500 ounces this month from 21,000 ounces in February, data on the Mint’s website showed today. Sales of silver coins climbed to 2.542 million ounce in March from 1.49 million in February. Gold imports by India, the world’s biggest, plunged in March after jewelers closed stores for more than two weeks to protest against higher taxes, an industry group said. Purchases may have been about 15 metric tons to 20 tons last month, compared with 75 tons to 80 tons a year ago, Prithviraj Kothari, president of the Bombay Bullion Association, said today by phone. Second-quarter imports may slide to 150 tons, from 250 tons a year earlier, he said. India may buy about 700 tons to 800 tons of gold in 2012, Kothari said. That compares with record purchases last year of 969 tons, according to World Gold Council data. India raised the benchmark price for imports of gold to $539 per 10 grams from $530, according to a statement from the finance ministry. The benchmark price for imports of silver was cut to $1,032 per kilogram, from $1,036, it said. The benchmark prices are used to set the tax on precious metals imports. In a back room in Birmingham Nigel Blackburn is busy smashing up pieces of Georgian silver in preparation for a "melt". Hedge-fund managers and other large speculators increased their net-long position in New York gold futures in the week ended March 27, according to U.S. Commodity Futures Trading Commission data. Speculative long positions, or bets prices will rise, outnumbered short positions by 147,821 contracts on the Comex division of the New York Mercantile Exchange, the Washington-based commission said in its Commitments of Traders report. Net-long positions rose by 16,358 contracts, or 12 percent, from a week earlier. Gold futures rose this week, gaining 0.4 percent to $1,671.90 a troy ounce at today's close. Miners, producers, jewelers and other commercial users were net-short 185,076 contracts, an increase of 18,938 contracts, or 11 percent, from the previous week. Each Friday the CFTC publishes aggregate numbers for long and short positions for speculators such as hedge funds and institutional investors, as well as commercial companies that buy or sell futures to protect against price moves. Analysts and investors follow changes in speculators' positions because such transactions can reflect an expectation of a change in prices. Hedge-fund managers and other large speculators decreased their net-long position in New York silver futures in the week ended March 27, according to U.S. Commodity Futures Trading Commission data. Speculative long positions, or bets prices will rise, outnumbered short positions by 18,655 contracts on the Comex division of the New York Mercantile Exchange, the Washington-based commission said in its Commitments of Traders report. Net-long positions fell by 2,514 contracts, or 12 percent, from a week earlier. Silver futures rose this week, gaining 0.7 percent to $32.48 a troy ounce at today's close. Miners, producers, jewelers and other commercial users were net-short 29,678 contracts, down 2,448 contracts, or 8 percent, from the previous week.